This product is manufactured and packaged in a facility which may also process milk, soy, wheat, egg, peanuts, fish and crustacean shellfish. KEEP OUT OF REACH OF CHILDREN. DO NOT USE IF SAFETY SEAL IS DAMAGED OR MISSING. STORE IN A COOL, DRY PLACE. 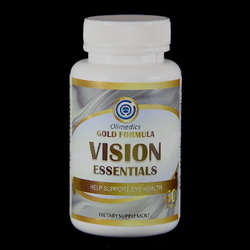 Active ingredients: Vitamin A, Vitamin E, Zinc, Lutein, Astaxanthin, Bilberry, Docosahexaenoic acid (DHA), Aicosapentaenoic acid (EPA), N-Acetyl-L-Cysteine, and Zeaxanthin. Other ingredients: Gelatin, silicon dioxide and vegetable magnesium stearate.